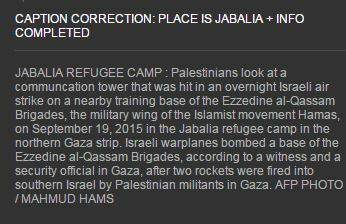 Following communication from CAMERA’s Israel office, the Agence France Presse today corrected a photo caption which omitted the essential fact that the pictured Gaza site, bombed during an Israeli airstrike, was a Hamas training camp. Yesterday, CAMERA’s Snapshots blog flagged the Sept. 19 image by AFP, an influential wire and photo service whose items are reproduced in media outlets around the world. The original erroneous captions have been removed from the archive and the AFP has replaced them with the corrected captions.